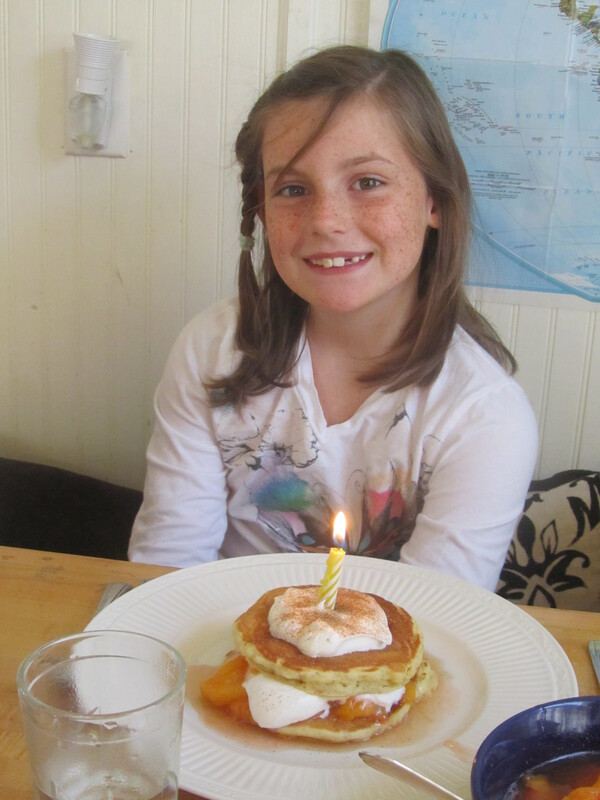 We recently had a birthday around here (Recently meaning within the month.) 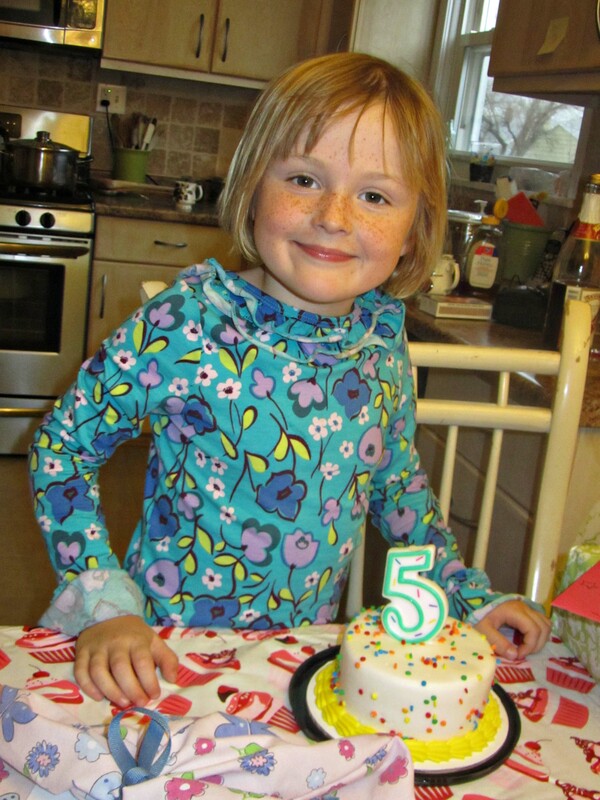 You will see two birthday cakes as Eloise was so sick at her birthday party (which she shared with her grandpa down in Florida) that we wouldn’t let her blow out the candles on the shared birthday cake. We are very considerate of our guests that way. 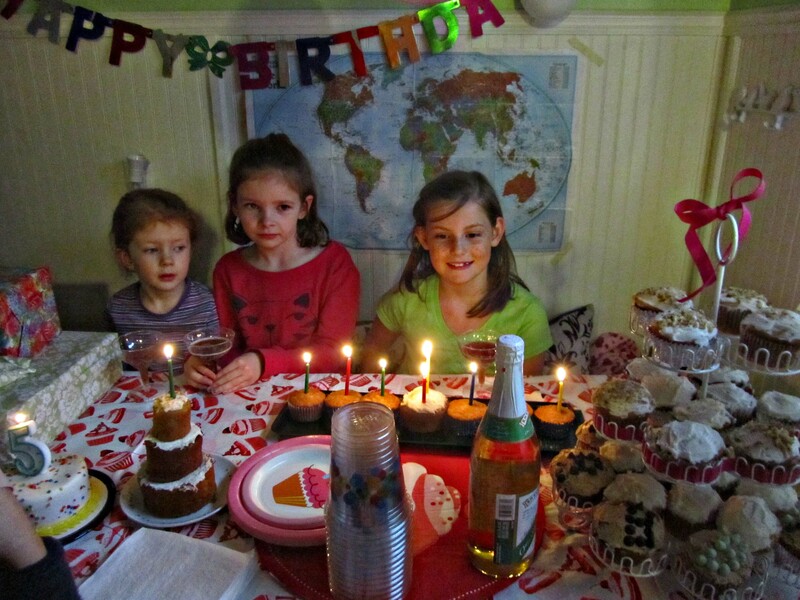 Parties in this family often happen in stages. We had some homeschooling friends over after ice skating, and then later in the day, some neighbor kids came over for more cupcakes and a little activity. 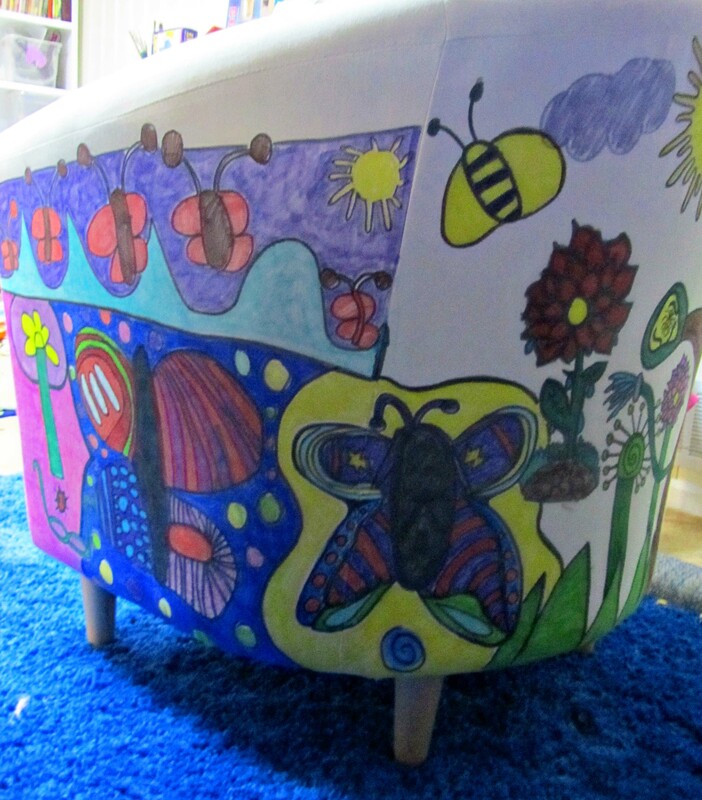 About two years ago, I thought that I would like to paint up a Princess Chair for my daughter’s birthday. I thought it would be fun to give her her own throne in her room. Since her room is very tight for space, since the budget was tight on extras, and since my clothes were very tight as I was expecting Number 4, nothing came of the great idea. Nothing except that I kept my eye open for a suitable chair to paint. 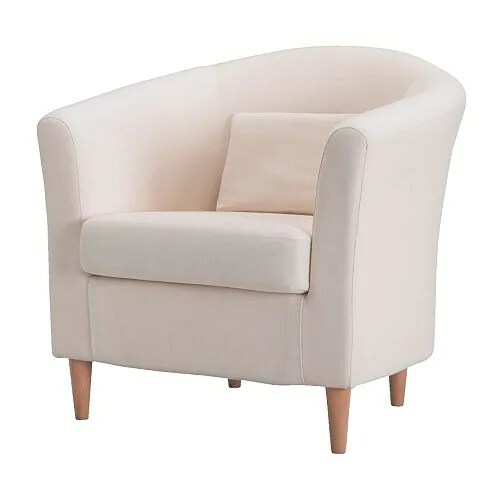 I was thinking of a wooden chair that somehow I would find at a thrift store for a bargin basement price, but when I came across this IKEA chair, I thought PERFECT. It is their SOLSTA OLARP CHAIR for approximately $65.00. 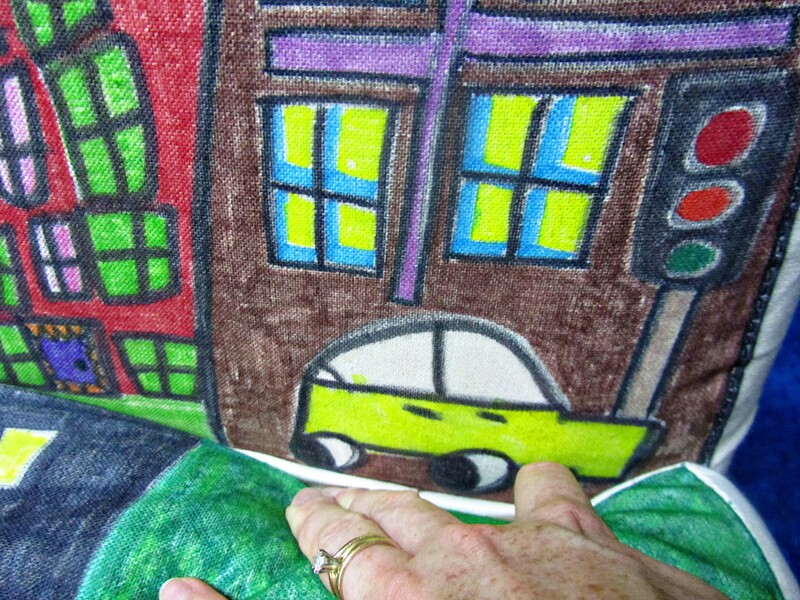 The fabric is white canvas which is what artists paint on all the time. Artists add a gesso (plaster-like covering) first, so that their medium (stuff you add to oil paint to make it flow and dry) won’t eat away the canvas. 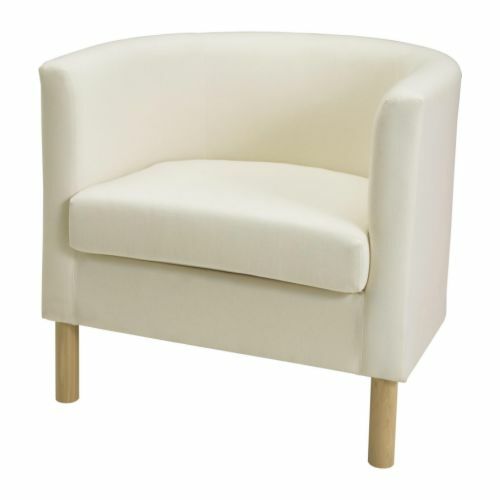 This SOLSTA OLARP CHAIR is comfortable for a child to sit in, but we ended up buying the TULLSTA chair for $99.00, as it is a very comfortable seat for an adult. 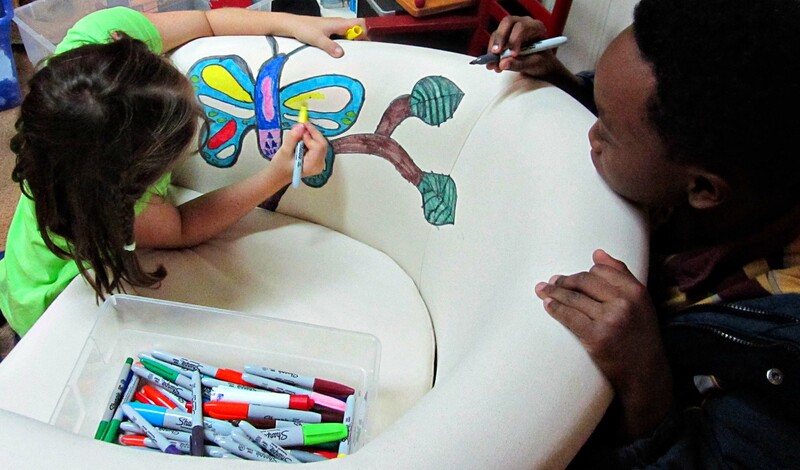 I brought out our collection of Sharpies and let the kids decorate the chair. I had some rules–NO WORDS. NO PEOPLE. USE BRIGHT COLORS. 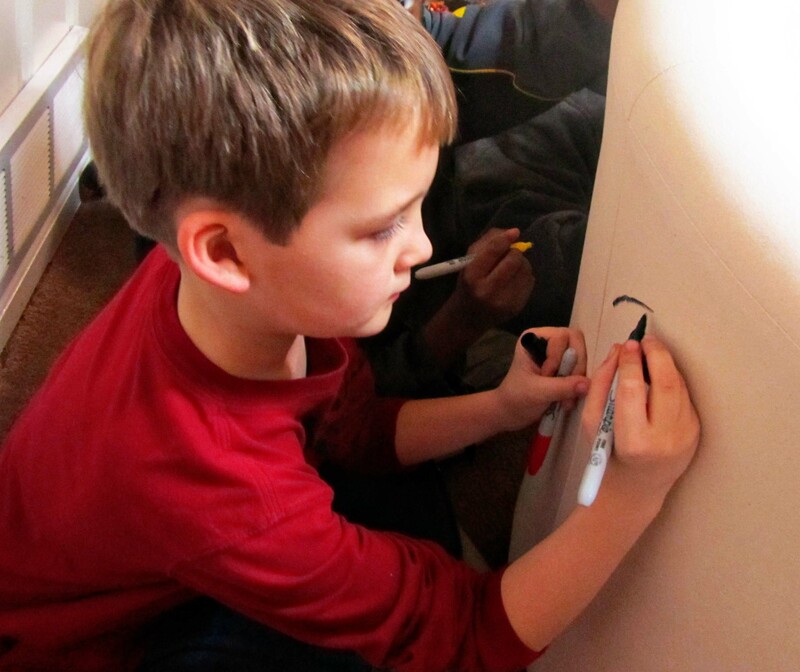 Here are some photos of the chair decorating. Here is that first, somewhat scary, very permanent, mark. Scout decided to copy a butterfly off a place mat of ours. Here are Eloise’s first marks. She had no inhibitions. 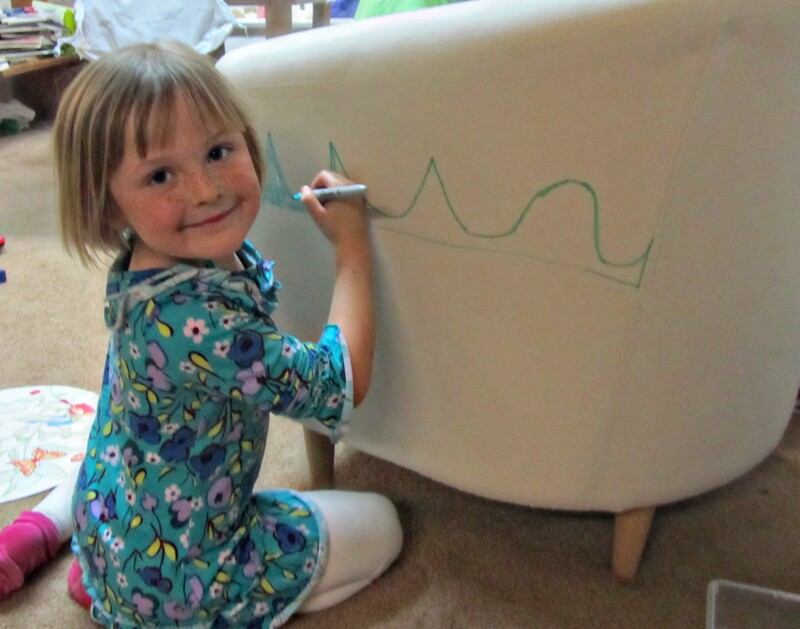 She also had no idea what she was going to draw, she just started. That is the fun of being five. The neighbors started adding their own drawings. 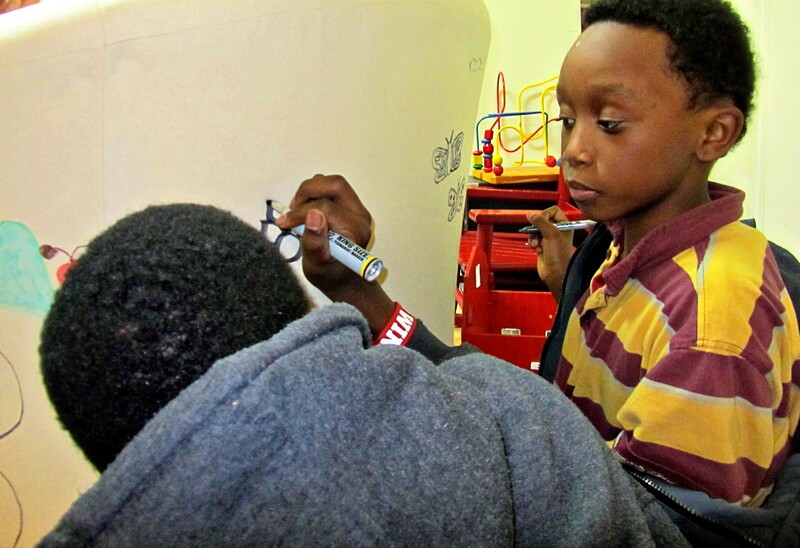 Believe it or not, both of these boys drew flowers. This neighbor added lightning bolts, storm clouds, and a smiling face. And No-Inhibitions Eloise added several of her own butterflies. 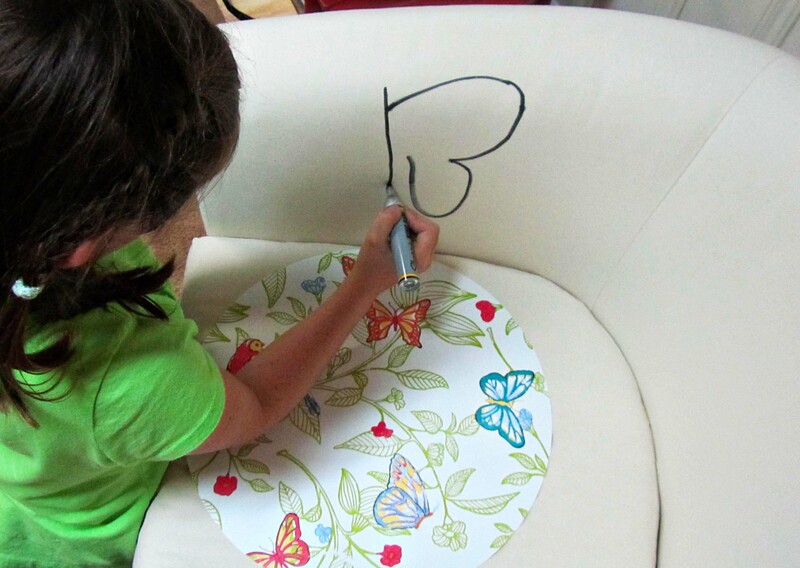 She preferred to draw upside-down. 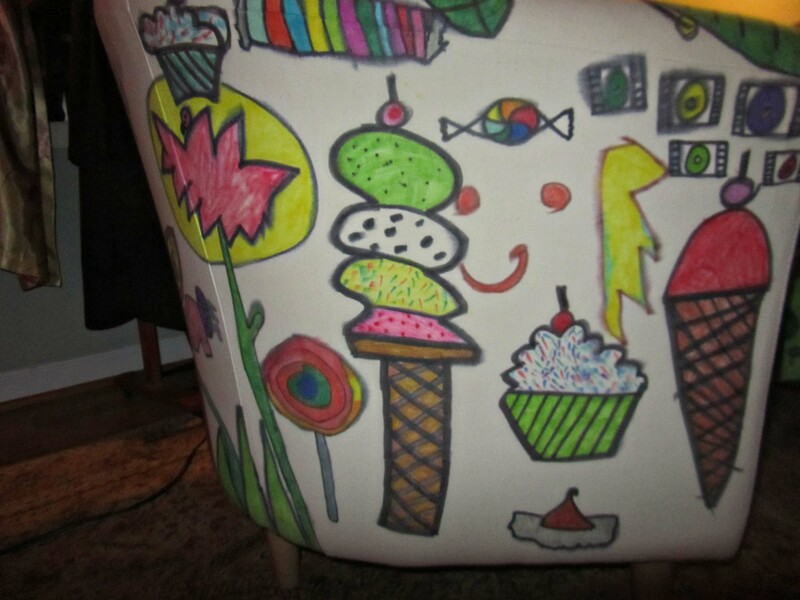 Although we began coloring the chair the day of the birthday party, it took about three weeks for us to finish. Attention spans just aren’t long when it comes to coloring it seems. 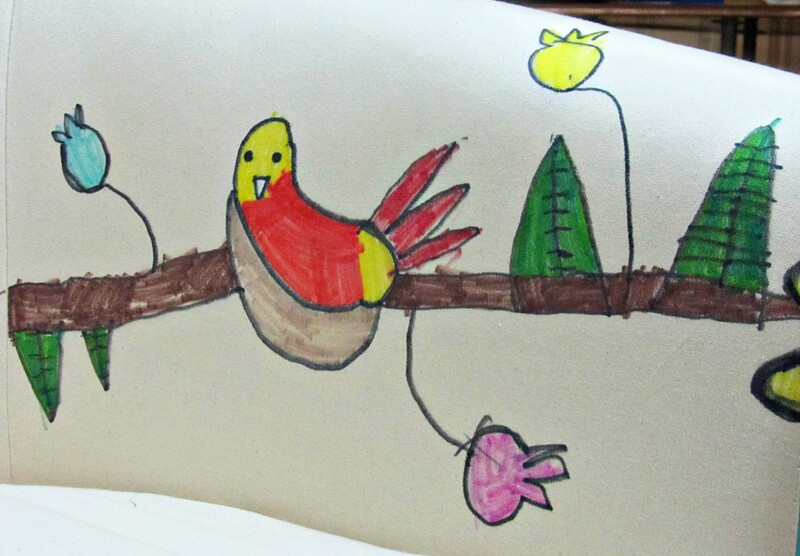 Eloise drew and colored this bird in a nest completely on her own. 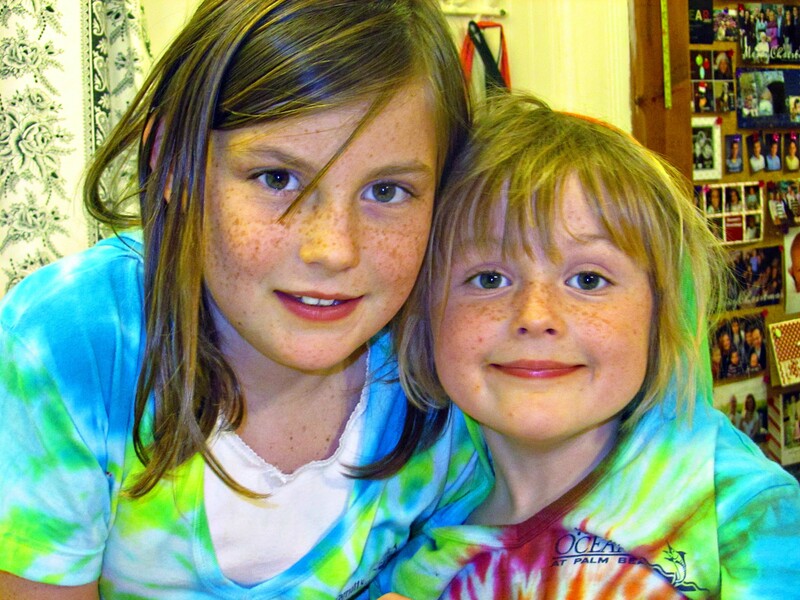 What I would do is re-color in the areas that the kids colored. I would also re-outline everything in a sharp black. It gave everything some strong definition. 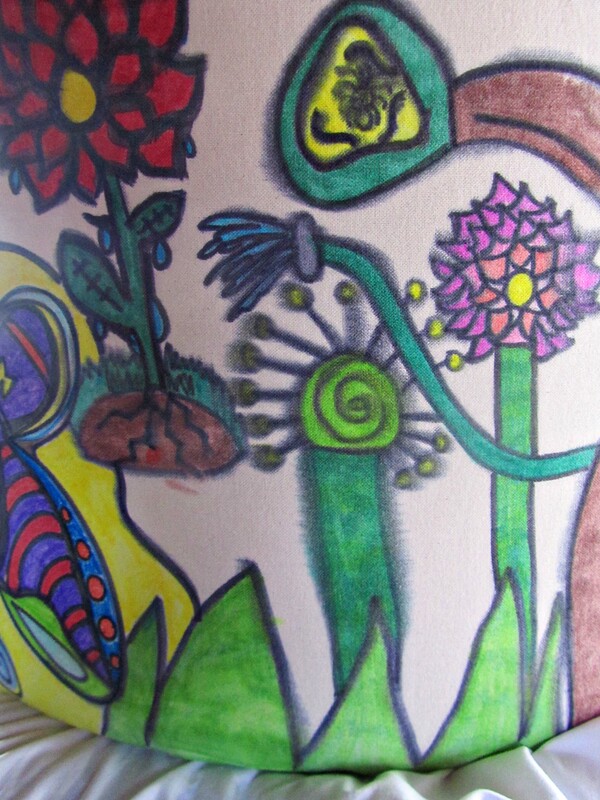 The left side of the chair was “Eloise’s Interpretation.” The Hunni said it looked like a psychedelic tatoo, but to me it is all Eloise. We bought two chairs. 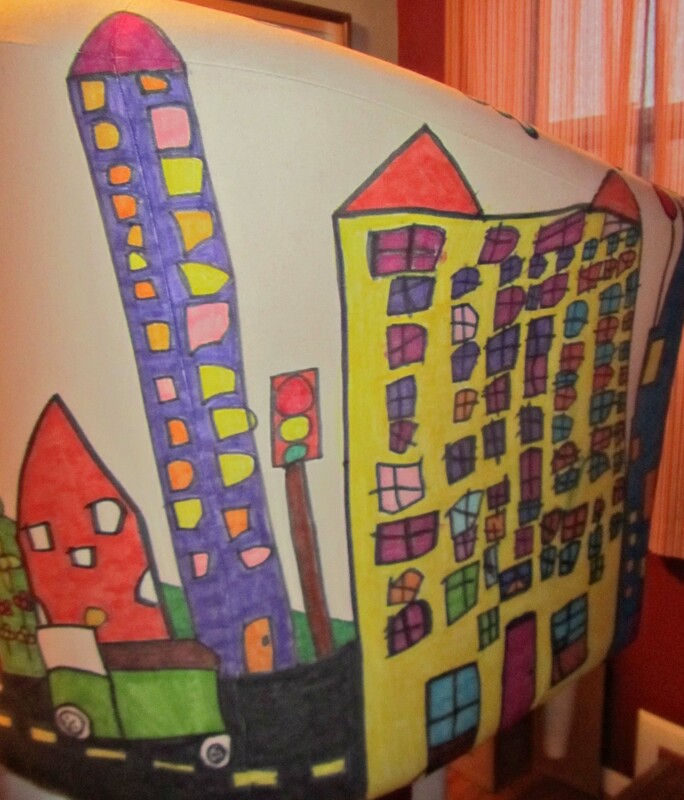 I realized that a theme helped raise the artistic level of the chair, so for the second chair we used a “Cityscape” theme. We also decided to keep the artwork within just the family. 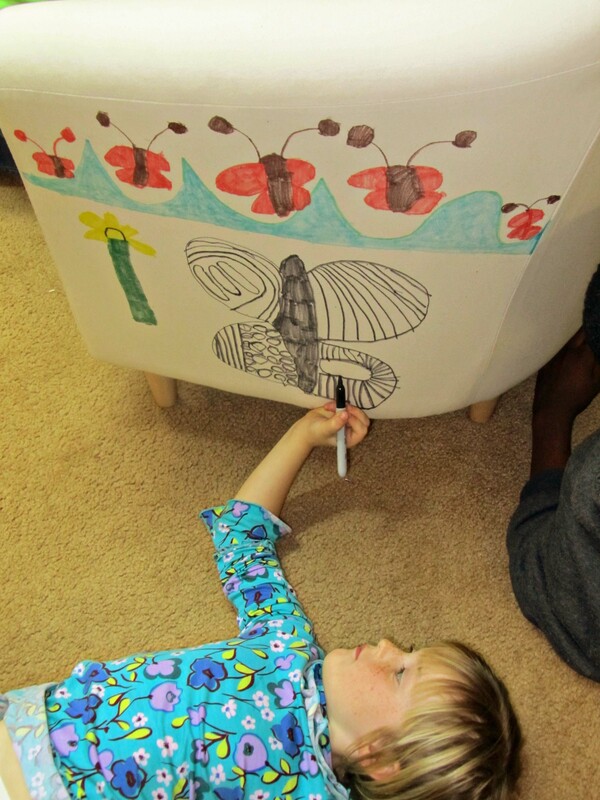 LBG–Little Big Guy–who wasn’t interested in drawing on the first chair added a very nice airplane to the “Cityscape Chair.” Little Man added elements to both chairs, but we tried to cover up his work. 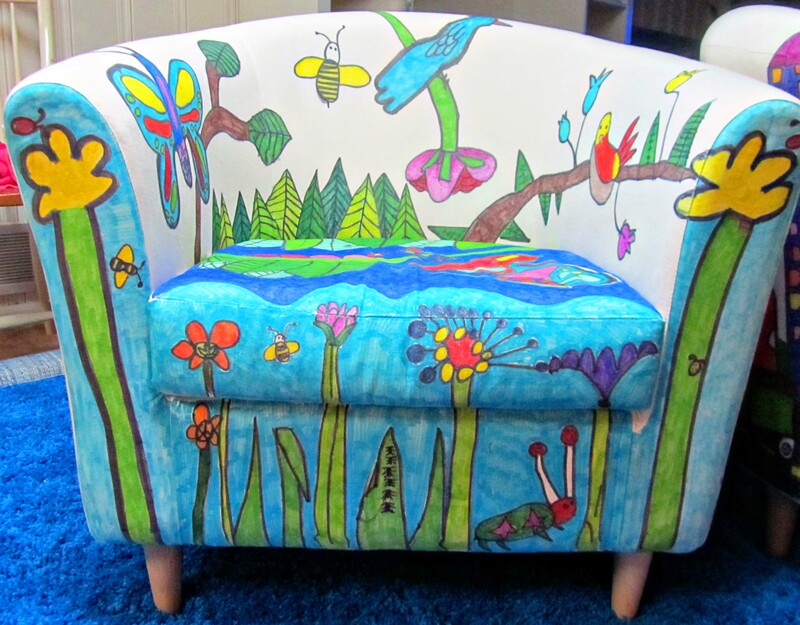 Here is the finished chair. Here is a front view. I’m sorry about the lighting. It was taken in our room, and our walls are painted a deep red. This is the right side of the chair. Eloise drew the large yellow skyscraper. 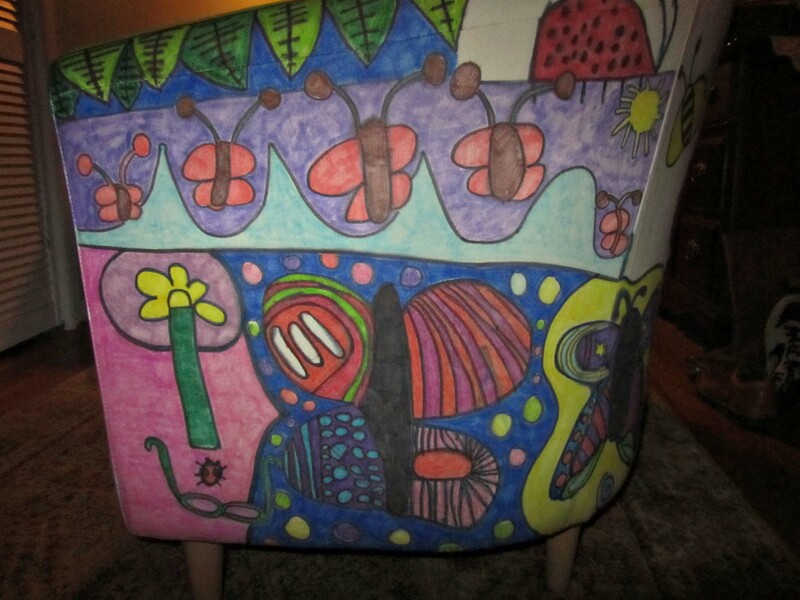 And this is the back of the chair. Again, sorry about the lighting. After we had finished drawing, I waited for a day above freezing, and then took the chairs out to the garage to give them two coats of Scotch Guard. I learned the hard way, that if you spray the Scotch Guard too close to the artwork, the black sharpie has a tendency to run. 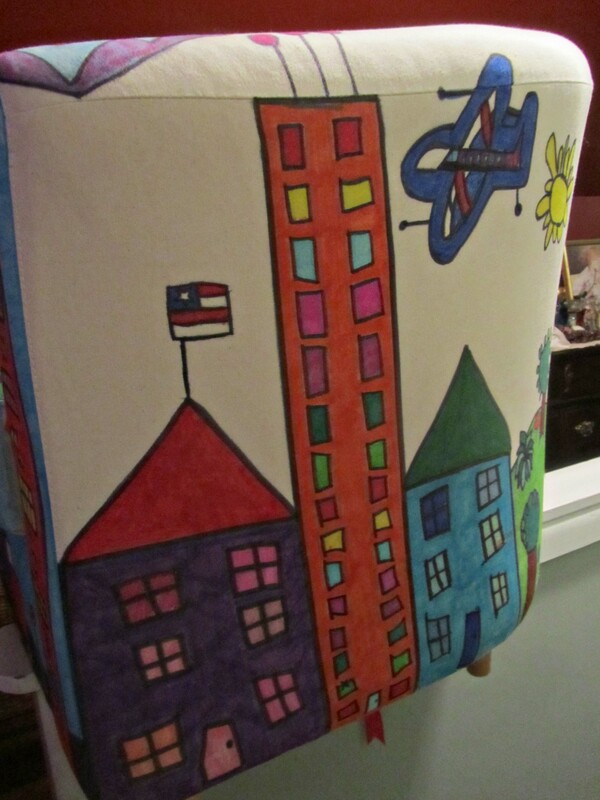 I didn’t spray so close on the “Cityscape Chair”, and I didn’t have any of the colors bleed or run. If you ever want to do this project, here are a few things we learned. No words. No people. and Use bright colors. 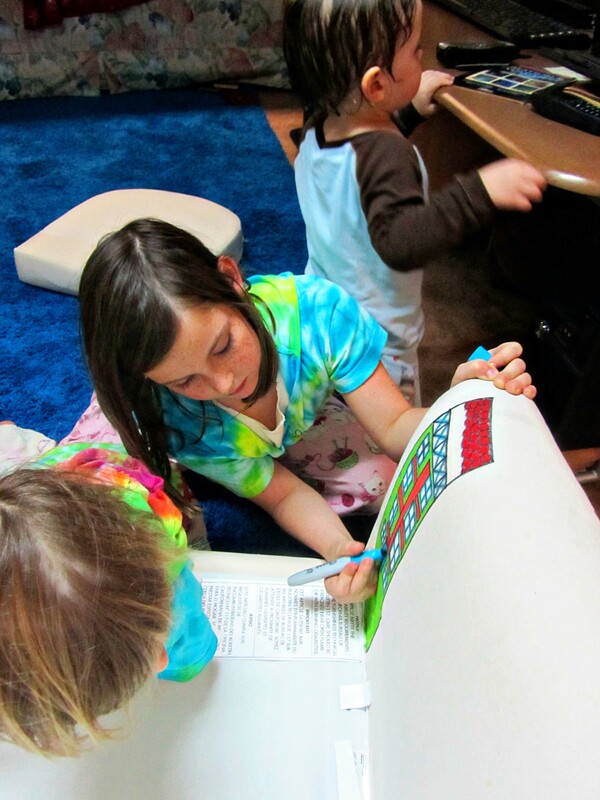 A theme gives the chair unity, and it helps the artists to have ideas. 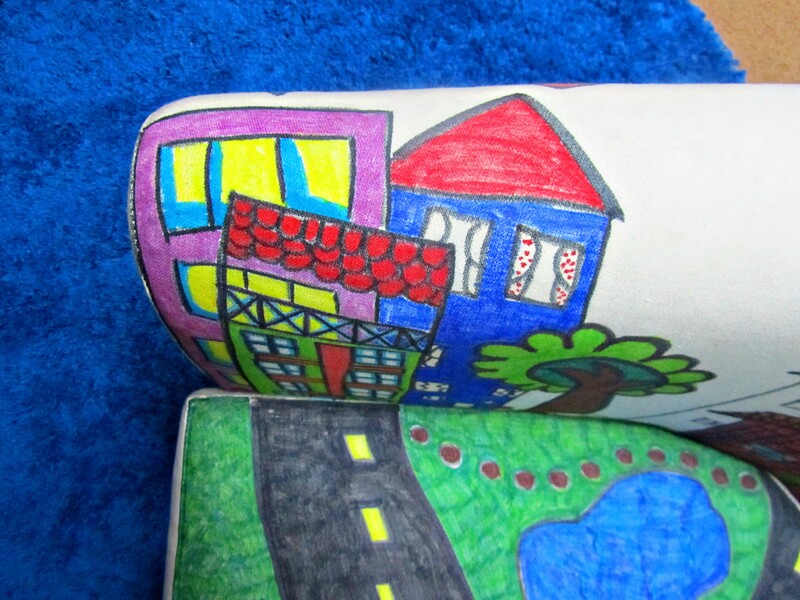 Although the neighborhood kids enjoyed coloring on the chair, it wasn’t “their” chair, so they weren’t as interested in their drawings being of their highest level. We used up an entire set of 24 Sharpies and a package of the broad tips. Spray the Scotch Guard from at least 7 inches away. Two light coats are better than one heavy coat. 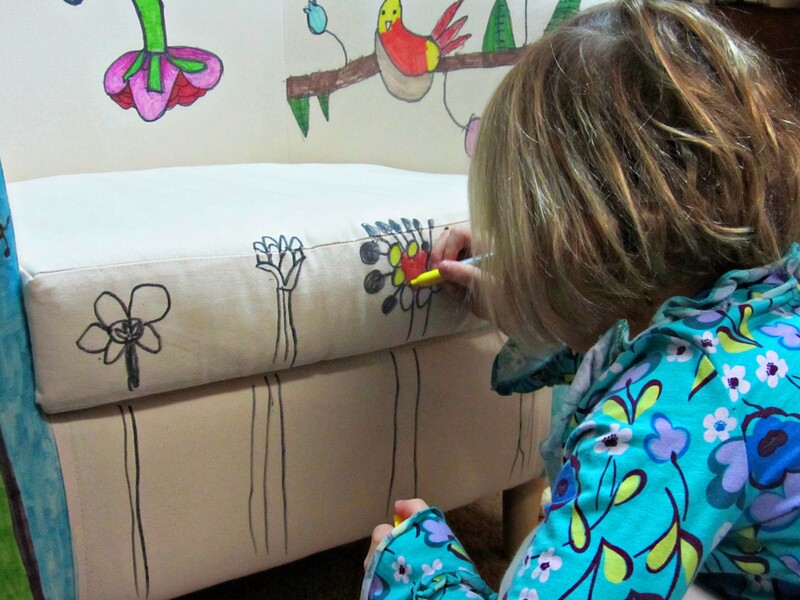 Take the cushion off when you are working on the front of the chair, but don’t forget to mark how high the cushion goes. 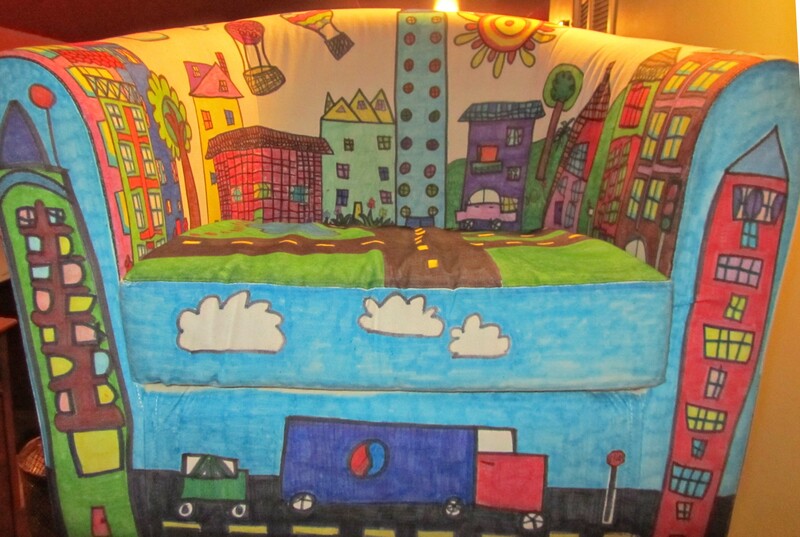 My favorite car on the entire “Cityscape Chair” is hidden below the cushion. Aren’t the wheels that look like eyes adorable? After having the chair around for three weeks, we found it was getting dirty right where you rest your hands when seated. We decided to cover that area with drawings. 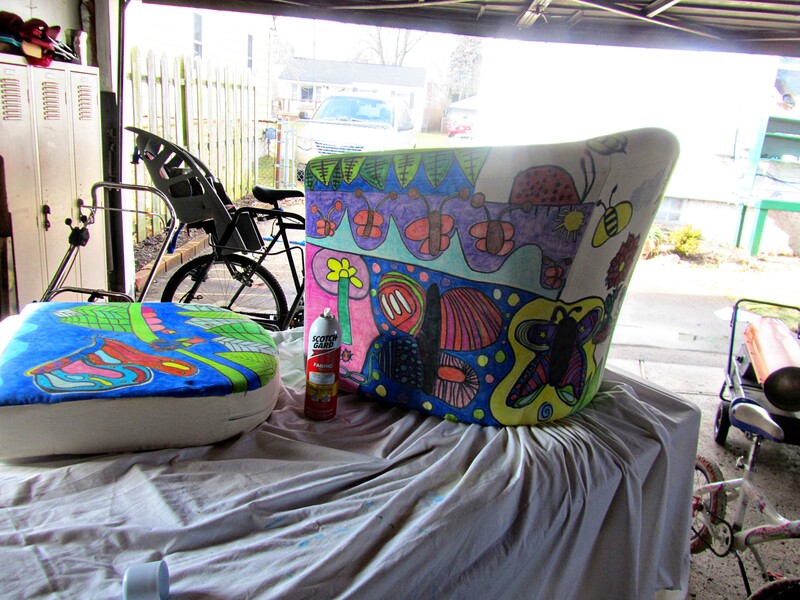 Here are the two colorful characters that did most of the work. Sorry for all the pictures. A bit lengthy. We had fun. P.S. The chairs had to seat adults for a reason, but more on that later. 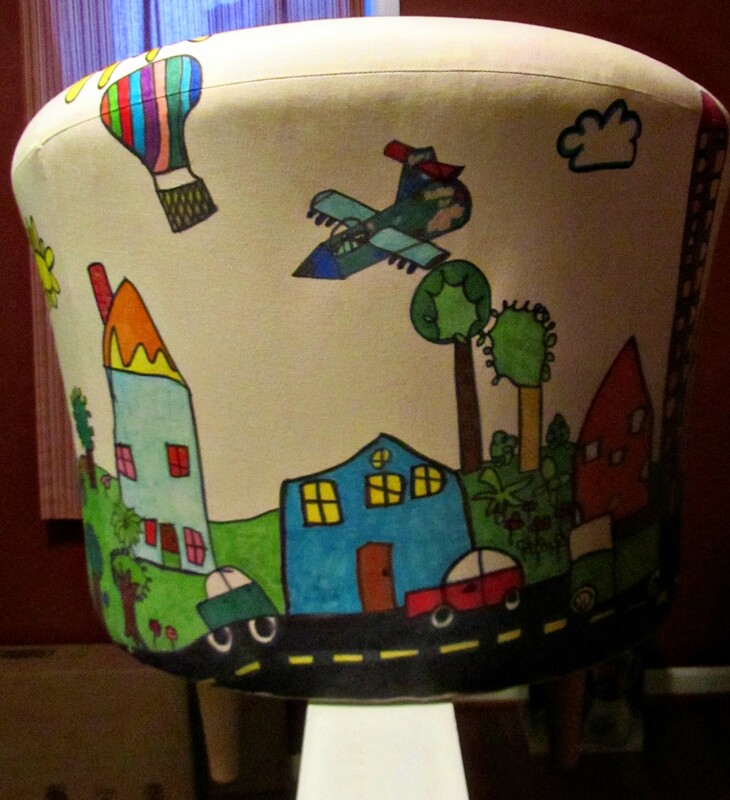 This entry was posted in Projects and tagged decorated kid chair, decorating kid room, project for kids. Bookmark the permalink. Now those are cool! How on earth did you keep anyone from scribbling? (If someone in light clothing sat on one of those, could they be seen in public again?) The kids (and Mom) did an awesome job. Such fun! 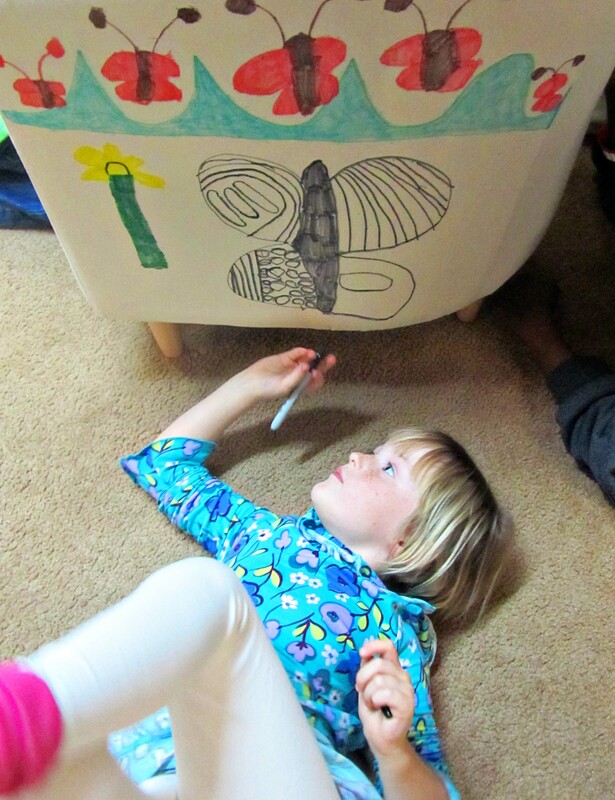 What if you had the kids make an outline drawing, then screen printed that on some T’s, and have the kids color them? We’d love to see some samples! save!!! Mary Jane and Audrey are SO cute!! Thanks. Wouldn’t a Princess Throne be fun? Send us a picture of your chair!! I’d love to see it. IKEA also has a canvas couch (a little more $$) but I was thinking that for the T.V./Wii/DVD viewing spot, it would make a fun couch.